What time is it? It's CARNIVAL time! 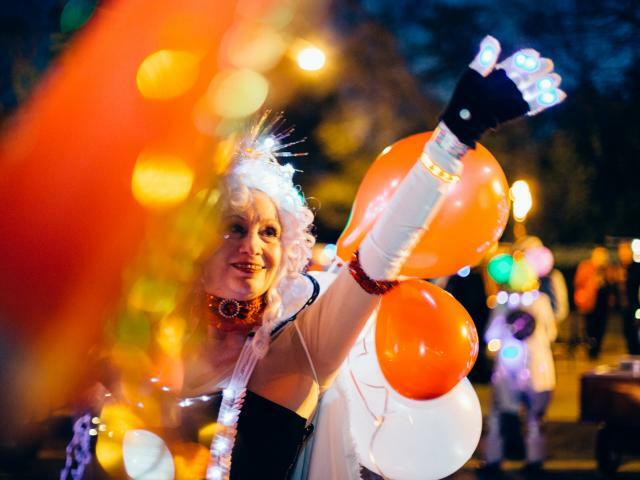 You may think Mardi Gras is only truly celebrated for one day, Fat Tuesday, but Mardi Gras season actually begins on January 6 - referred to as the Feast of the Epiphany, Three Kings Day or the Twelfth Day of Christmas. 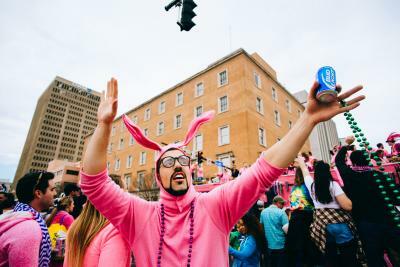 This means from now until Tuesday, February 28, you&apos;ll find most Louisianians and visitors indulging in rich foods, good times, funky costumes and maybe a little booze and king cake before fasting during the Lenten season. Starting today, you&apos;ll see all of the local bakeries advertising their succulent King Cakes to kick off Mardi Gras season. Now, King Cakes have come a LONG way. History tells us that in 1870, the King Cake was brought to New Orleans from France. Decorated in royal colors of purple, meaning "Justice," green meaning "Faith," and gold meaning "Power," the cake was to resemble a jeweled crown honoring the Three Wise Men who visited the Christ Child on Epiphany. There have always been fun tokens hidden in the cake, which is now typically a plastic "baby." Check your piece while eating because you have to bring the next King Cake if you&apos;re lucky enough to get the baby! 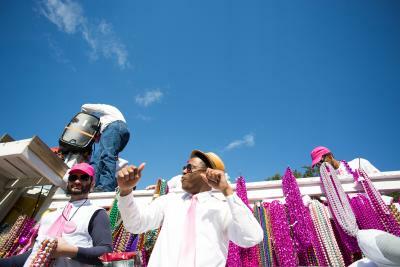 Throw your hands up and yell "Throw me somethin&apos; Mister" as the Krewe of Southdowns makes its way through the streets of the southdowns neighborhood where people will be lining the streets and enjoying the parade in a "tailgating" fashion. 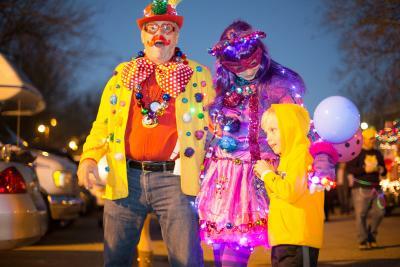 From the looks of it, the theme of the year pictured was "Circus." 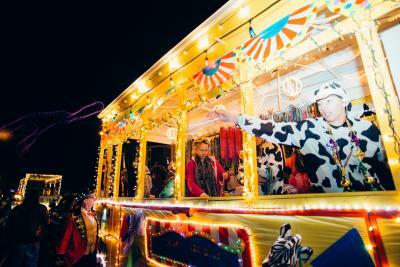 Each year, every Mardi Gras Krewe establishes a new theme. The Krewe of Spanishtown rolls through downtown with a gorgeous backdrop of the State Capitol while filling parade watchers&apos; hands with beads. This might not be the most politically correct parade as the theme is typically sarcastic, and often makes fun of people in positions of authority, maybe sometimes even indecent - we warned you! Be on the lookout for another blog post on this parade. ...or an entire family dressed up from head to toe! 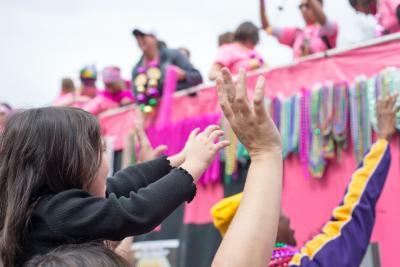 And as a mom or dad, you can lift up the little ones on your shoulders so they can catch the best Mardi Gras beads, stuffed animals, Moon Pies and more! 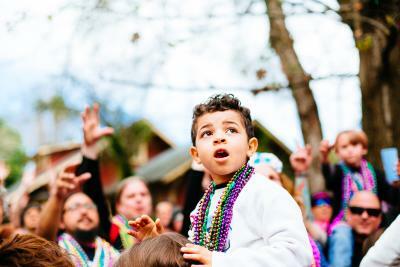 Let&apos;s be honest, the float riders think the little ones are the CUTEST, therefore, they get more. 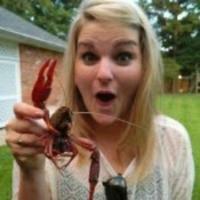 So come on down to Baton Rouge and let&apos;s go to the Mardi Gras and dance to some Carnival tunes like this guy! Start planning your trip now! And let us know if we can do anything to help make your stay a memorable one. 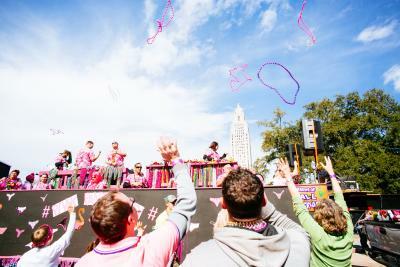 For a complete list of Mardi Gras Parades, click here.